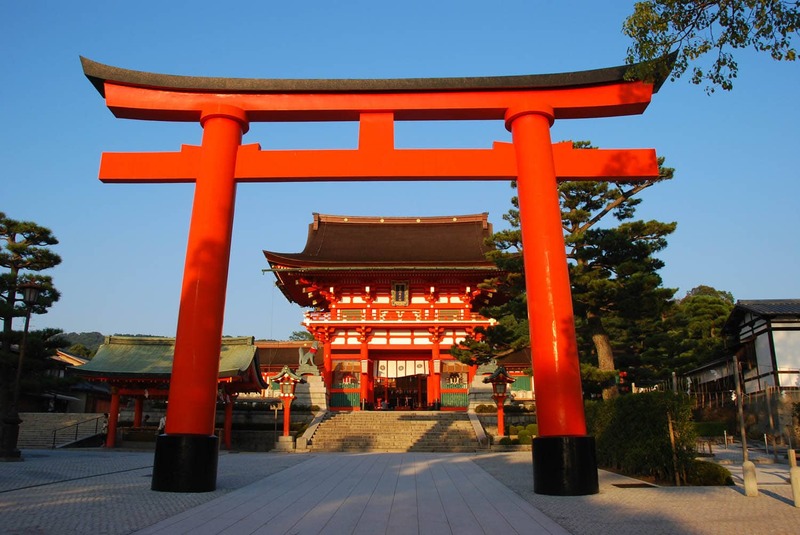 When visiting or seeing images of Japan, one of the most iconic symbols is definately the torii gate. With their vermilion colour and beautiful architecture, these gates create an air of awe and inspiration among many. A huge entrance torii, Fushimi Inari. Image credit. Torii (鳥居 – literally meaning ‘bird abode’) are traditional Japanese gates found at the entrance or within Shinto shrines. They symbolize the transition from the mundane to the sacred – the spiritual realm of the kami. They are also the easiest way to identify a Shinto shrine, although they are also a common sight at Japanese Buddhist temples. Shinto shrines may have one, or many torii gates. Smaller shrines may have one or two at the entrance whilst more established shrines, such as Fushimi Inari, may have thousands. Inari shrines tend to have many torii as those who have been successful in business will often donate a torii in gratitude to Inari. Most torii are made from wood and painted red/orange/vermilion and black, though they can come in other materials and colours. Other materials include copper, reinforced concrete and stainless steel. One of the famous torii tunnels, Fushimi Inari. Image credit. Torii are first mentioned in a text written around 922 in the mid-Heian period. The oldest existing torii is made of stone and was built in the 12th century, belonging to a Hachiman shrine in Yamagata prefecture. The oldest wooden torii is at Kubō Hachiman Shrine in Yamanashi prefecture – built in 1535. 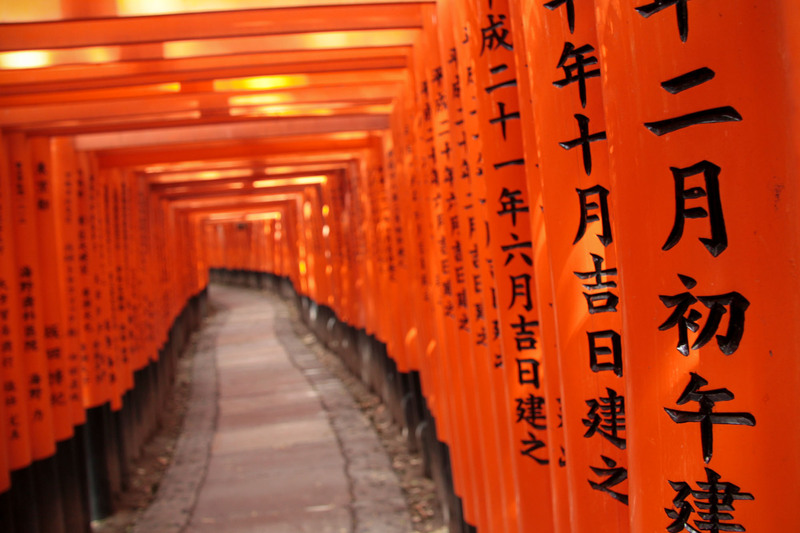 The origins of torii are unknown and there are many different theories on the subject. Because symbolic gates are common all over Asia, historians believe that torii are an imported tradition. Similar structures to the torii include the Indian torana, the Chinese pailou and the Korean Hongsalmun. Another entymology of the word torii is ‘通り入る’ – ‘pass through and enter´. This fits very well considering the function of the structure. Another hypothesis is that the name ‘bird abode` means that the torii was once a literal type of bird perch. Bird perches have often been a religious aspect in many cultures due to the magical and spiritual properties of birds. It is believed that structures which were once used as religious and evil-repelling bird perches could have very well evolved into today’s torii. The simplest type of torii is the shime torii or chūren torii (注連鳥居). This is believed to be one of the oldest types of torii, consisting of two posts with a shinenawa tied between them. All other types of torii are divided into two families: the shinmei family (神明系) and the myōjin family (明神系). The first family have only straight parts and the second have both straight and curved parts. I could make a whole other post on the torii styles, so here are some examples! Example of a shime torii. Image credit. Hachiman torii – Example of a straight torii. Image credit. Daiwa torii – Example of a curved torii. Image credit. An unusual white and red Nakayama torii. Image credit. There are also small types of torii for personal kamidana and hokora. These are available to purchase both online and from shrines directly. These also come in a variety of styles but are usually made from wood. A wooden home kamidana torii. Image Credit. A small vermilion wooden torii. Image credit. I hope you enjoyed reading about torii today and maybe understand a little more about them! If you have any ideas on anything I can blog about, let me know!